I couldn't believe my eyes. I went on Twitter like I do dozens of times each day, but this time, there was one topic dominating social media. "Roy Halladay's plane involved in a crash. One body discovered. More details to follow." Obviously, my first instinct was to mourn the loss of whomever was in that plane. Either way, someone had lost their life on the afternoon of November 7th, 2017. Selfishly, I didn't want it to be him. "Please, not my childhood idol. Not Doc." At 4:15pm, it was announced that the body discovered was indeed Roy Halladay. He was just 40 years of age. I took a break from writing. I needed to focus my energy and attention elsewhere, and writing was impeding my day to day life. The Jays were doing me no favours, and the Raptors and Leafs have just begun their respective seasons. Nothing had motivated me to return to writing...until now. This is the first time I have ever had to write a piece like this. I'm relatively young in the eyes of the sporting world, and I have never seen one of my sports idols pass away. Until now. There's a lot that's been said about Halladay over the past few days by people with far more information about the type of person and player that he was. I'm here to give you the perspective of a young boy, who loved the game with a passion and admired the man they call "Doc". Growing up as a child who just missed the Blue Jays World Series run by a year, I didn't get to witness much quality baseball until 2015. The main reason why I was a Blue Jays fan can be accredited to one man...Roy Halladay. Every fifth day, you knew that the Jays were the best team in baseball with him on the mound. They could have the worst offensive day, but as long as you scored him a couple of runs in the game, it was essentially game over. The opposing pitchers knew they had no room for error, because Halladay would baffle offenses across the league. It was obvious to anyone that watched the game that Halladay was incredibly gifted, but it was just more than raw talent and ability. You would hear stories of Halladay completing workouts in the morning before anybody else was at the complex. How he devoted every waking moment to improving a near perfect craft, as he felt like he could always be better. He handled adversity better than others, after being demoted to single A Dunedin, then coming back to be a Cy Young pitcher. You could see how he carried himself with confidence, not cockiness. As a young boy watching on, I witnessed first hand how hard work, determination and humbleness can bring upon success. If you put the hard work in, good things will follow. If you embrace life's challenges and tackle them head on instead of running away from them, good things will follow. It wasn't a coincidence that Roy Halladay was one of the best pitchers to ever play the game of baseball. Roy inspired me to learn the art of pitching. I wanted to be just like him on the field. I wanted to have everybody fear me on the mound, but respect me off it. As the years went on, and I became a little older and a little wiser, I realized that I wanted to be just like him off the field too. I knew that I wanted to be someone that everybody loved, not just because I am good at my job, but because of how I treated everybody I met along the way. 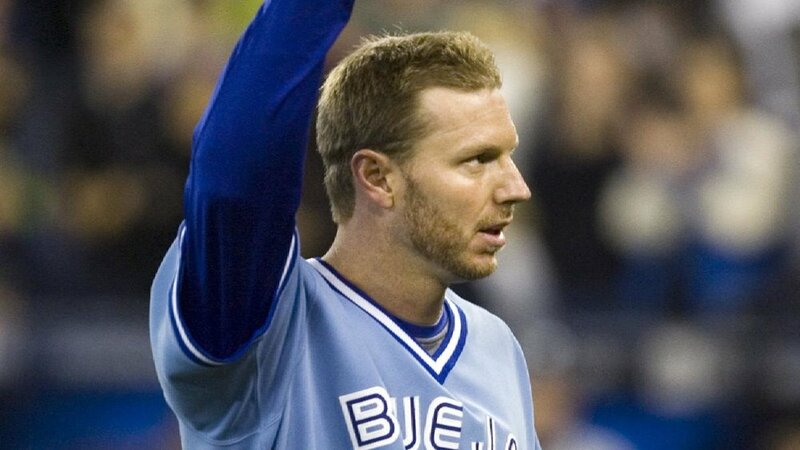 Halladay was arguably the most influential athlete in Toronto during his tenure with the Blue Jays. The city loved him, and he loved the city back. He gave everything he had to the city of Toronto and the Blue Jays organization. In an era that saw Toronto-based superstar athletes such as Vince Carter and Chris Bosh get shunned and jeered on their way out of Toronto, the city embraced Halladay's return to Toronto in a Phillies uniform. In that particular time, it was incredible to see. I'll never forget watching the 2010 MLB Playoffs. The Phillies were the team I was cheering for. The reason was clear. It was Roy Halladay's first postseason start of his career. He had been waiting a lifetime for this moment...and he pitched one of the most memorable postseason outings in MLB history. I remember jumping up and down, screaming at the top of my lungs when they recorded that final out. I knew that I would probably never see something like that ever again in my life. See for me, it didn't matter what uniform he was wearing. He was my idol. I learned a lot from Halladay growing up. I learned about the game baseball, I learned about the art of pitching, and most importantly, I learned how to be an respectful and humble person. I want to thank you Doc for everything you taught not only me, but so many other individuals, young and old, across North America. I want to extend my deepest sympathies and condolences to the Halladay family, his wife Brandy and his two sons Braden and Ryan. Toronto will always be here for you.